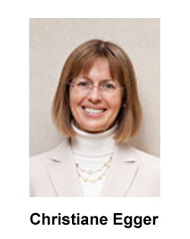 Christiane Egger is the Director of the Regional Energy Agency of Upper Austria. Founded in 1991, the agency runs various projects on energy-related issues with the main mission of promoting renewables and energy efficiency practices. To achieve these objectives, Christiane Egger is leading the CleanTech-Cluster, a regional energy platform established in 2000 that brings together key renewable energy providers including many of the country’s leading biomass boiler manufacturers. In fact, 25% of the automated biomass boilers sold in the EU are produced by members of the Cluster. The European Pellet Council (EPC—an AEBIOM network) interviewed Christiane Egger on the Cluster’s vision of the buzzword, “smart building,” and its future opportunities for biomass market players. EPC: Behind the buzzword, is there today a clear definition of what is a “smart” building? Unfortunately, there is not a common understanding of what is a smart building, in a legal sense. At this stage, smart buildings are a promise, a vision often promoted by IT players for the future of our energy consumption. This is why the CleanTech-Cluster is promoting the establishment of a more precise definition. 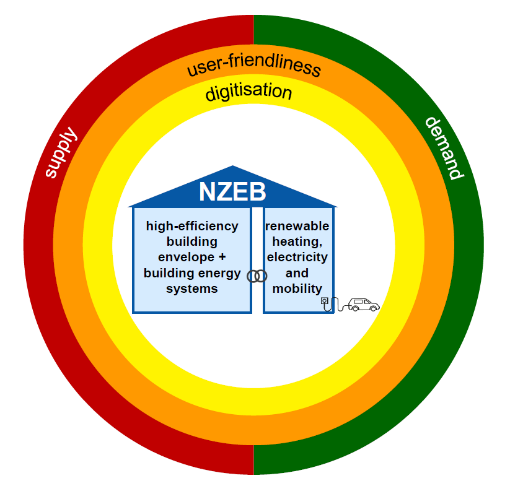 First, a building should be considered “smart” only if it is a “Nearly Zero-Energy Building” (NZEB). It wouldn’t make any sense to try to make a building smart without first ensuring high standards of energy efficiency and emissions limits. On this sound foundation, we can add two key elements: digitalisation and user-friendliness. Digitalisation is the most well-known aspect as it covers the ability to gather data about energy consumption and adjust the equipment accordingly. User-friendliness is the final element, meaning the end consumer is able to understand the data generated through digitalisation and to have control over it in an intuitive way— to turn data into action. This definition now needs to be converted into a harmonised European approach. We would welcome the introduction of such an approach in the upcoming revision of the Energy Performance of Buildings, for instance. Beyond a certain clarification, this would also send an important signal to the market and help it structure itself around clearly defined perspectives. Taking an example, why have Austrian manufacturers become some of the most important players in the European pellet boilers industry? Because in Austria, fuel standards were implemented more than 20 years ago, giving national manufacturers a stable framework and allowing them to produce standardised boilers. Smart buildings without European standards could remain a collection of IT features, not realising its full potential in terms of efficiency and GHG emissions reduction. EPC: What are the main opportunities for the pellet sector and consumers regarding the development of smart buildings? I see at least two main advantages for the end consumers, which can be translated into new opportunities for boiler manufacturers. Smart buildings could induce a new role for boilers as a central home’s interface. As such, boilers could become “playful” appliances improving the end user’s control of their energy consumption and knowledge about their heating installation. Digitalised boilers will also bring convenience to consumers through advanced maintenance and control systems. This great advantage for the end user can be turned into opportunities for the industry to structure new services such as the automation of the delivery systems based on the boilers’ fuel level, for instance. Smart buildings will prove pivotal in terms of customer empowerment. The concept holds indeed the promise of independence for the end user, a notion that we know is much sought after. Already we see firms like ÖkoFEN working on systems that couple micro scale CHP and smart controllers to create entirely off-grid smart buildings. On a related note, wood pellets have a clear edge in terms of customer empowerment, as pellets are one of the most reliable sources of storable, clean energy. In this context, the development and success of “boilers 2.0” could support the establishment of the wood pellet industry across Europe. EPC: What about the challenges posed by smart buildings to the sector? One may only speculate at this stage as to whether or not disruption will come to the heating sector, but it seems crucial to be able to anticipate it. Smart building revolution is an underlying trend, not following it will let other energy sectors fully embrace it and leave an unbridgeable gap. Indeed, from the pellet producer to the installer, all would need to be trained and revise their processes to adapt to this transition. For example, one of the prerequisites for the whole system to deliver its full potential is to connect it to the internet, which sounds simple but has a profound impact on every step. There is also a major hurdle to overcome for all actors in the smart buildings sector, which is to find new and competitive business models. Simply put, we need to find the way to increase the cost efficiency of smart building installations for the customer or create business through the provision of new buildings and energy related services. In conclusion, I would say that the development of smart buildings is full of opportunities for biomass, that the industry should seize fully. Biomass still holds a lot of promise and untapped potential and it could be enabled with smart buildings if things are done right. This means for the whole sector to be active in developing new products and services in line with the digitalised energy and building world, and to communicate about them to the broader audience. Here is our chance to make biomass cool again!